DNA My Dog offers simple cheek swab DNA tests that allow you to learn more about your dog, including its unique genetic background, personality traits, recommended exercise levels, and much more. The company has been operating successfully for 10 years now out of its corporate headquarters in Toronto, Canada. All dogs are genetically unique, so exploring their DNA is the only way to truly get to know them. Genetics dictates everything about your pet, from personality and physical appearance to recommended care regimens and predispositions for certain genetic diseases. Read our in-depth DNA My Dog review to learn how to connect with your furry friend on a level that truly matters. 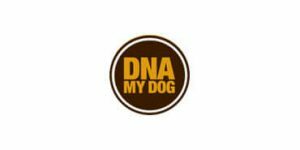 Placing an order – You can browse all available DNA My Dog tests and place your order on the official website. Your personal DNA testing kit should arrive at your home address 2-7 days after the company receives your order. Collecting the sample – DNA My Dog utilizes buccal swabs for sample collection. All you have to do is swab the inner side of your dog’s cheeks to collect saliva. The entire process is completely painless and takes under a minute. Alternatively, you can also opt to send your dog’s blood instead of buccal cells, but note that DNA My Dog charges 20$ extra for testing blood samples. Sending the sample back – After securing your dog’s DNA sample, you need to send it back to the lab for further processing. Inspecting the results – Your final report should be generated in around 2 weeks after your dog’s DNA sample reaches the lab. It will be available online for easier exploration. DNA My Dog is a good choice if you’re looking for a budget dog DNA testing service that can help you learn the essentials regarding your dog’s background and predispositions for certain genetic diseases and conditions. Before discussing specific testing solutions, we have to go over a couple of shortcomings we encountered during our research for this DNA My Dog review. First of all, the company cleverly tiptoes around giving the exact number of genetic markers tested in the official FAQ. It gives us a scientific explanation as to why the actual number of markers is not all that important as compared to the number of explored canine breeds. This is true, but we still want to know the exact number of checked genetic markers. Speaking of breeds, DNA My Dog features only 101 canine breeds in its database, which is okay but pales in comparison to other companies that feature 250+. The company never states the exact number of tested breeds and makes you count them yourself on the dedicated sheet. On the other hand, the number of available breeds is constantly updated. DNA My Dog Breed Identification Test (68.99$) – This is the main test offered by DNA My Dog. It checks your dog’s DNA for the presence of 101 different canine breeds. If you order 2 or more kits, you can save 5$ per kit. Unfortunately, the dedicated page on the official website spends more time talking about the free DNA My Dog Life Plan service than the breed identification test itself. As a consequence, we don’t know all that much about the test, except for its price and the number of canine breeds it screens for. DNA My Dog Breed Test PLUS Wolf-Coyote Hybrid Test (88.99$) – This test allows you to identify potential coyote heritage in your dog’s DNA. Deceased Dog DNA Breed Testing (157.00$) – One thing we particularly like about DNA My Dog is the fact that it allows its users to test their deceased dogs. This test is performed in partnership with the Paleo DNA Laboratory at Lakehead University. It uses your dog’s personal items for testing. You can always email or call DNA My Dog to discuss the items you possess and have them assessed for you. Viable testing items include blankets, toys, toothbrushes, chewed household items, and other items that contain your dog’s saliva. The test cannot be performed using collars, clothing, and food & water dishes. DNA Breed Identification Test PLUS Full Genetic Screening (225.90$) – This testing bundle includes the aforementioned breed identification test, Life Plan, Health Plan, and screening for more than 100 most common genetic diseases. This option is most commonly ordered by breeders, but it is also an excellent testing tool for pretty much any dog owner. Note that this test takes 4 weeks to complete. DNA Breed Identification Test PLUS Health Plan (110.99$) – DNA My Dog Health Plan includes specific health risks for your dog, disease risks, genetic information on all diseases, information about risk factors, a printable worksheet you can share with your veterinarian, and much more. Canine Health Plan without the DNA Identification Test (50.00$) – This option only deals with your dog’s potential health risks without analyzing its breed composition. Canine Full Genetic Health Screening without the DNA Identification Test (150.00$) – This genetic screening will tell you everything about your dog’s predispositions for more than 100 genetic diseases without going into breed percentages. 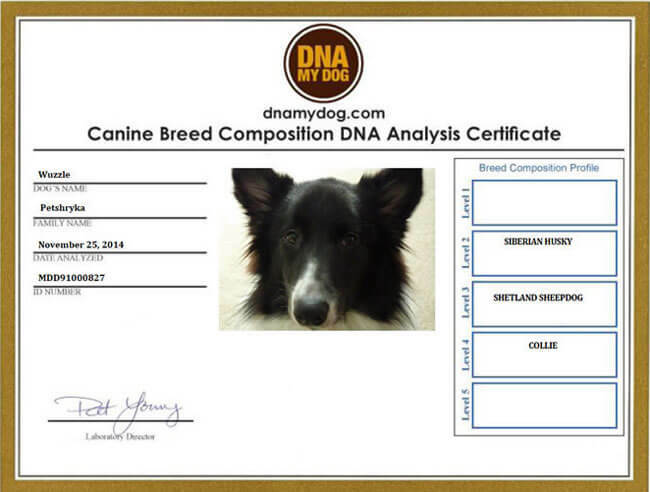 Note that DNA MyDog offers testing solutions specifically designed for mixed breed dogs. In other words, they may not be right for purebred dogs as they can give inaccurate results. With every test, you’ll also get a custom certificate with your dog’s photo. You can send a physical photo with your testing kit or upload it at a later date. This is a major red flag since DNA My Dog processes your payments and gains access to other sensitive information throughout the testing process. 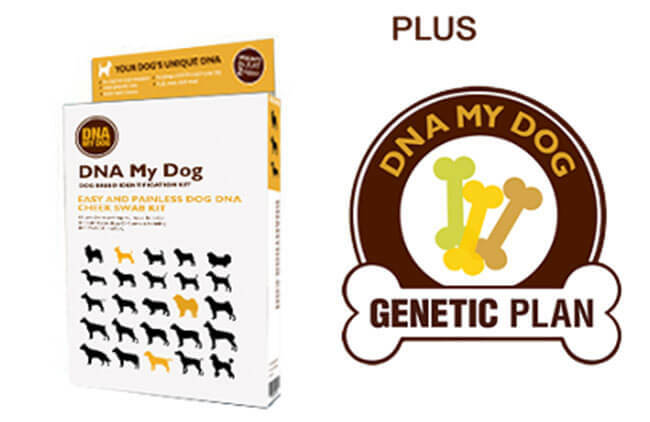 DNA My Dog is very sparse when it comes to information regarding its shipping options. It states that it ships its testing kits worldwide but not much else. A “free shipping” label stands under every available test, but we can’t say whether that only refers to orders within Canada, America or the entire world. The official FAQ mentions “regular shipping” in one place, so we assume express shipping is also an option. DNA My Dog says that its testing kits should arrive within 2-7 days when using regular shipping. Basically, you’re bound to contact user support if you want to learn more about the company’s shipping options and potential fees. However, the contact form presumes you already ordered the test and requires you to enter your customer ID and the name under which the test was ordered. This means you cannot use the contact form unless you are already a customer and have to look for answers over the phone. DNA My Dog features a couple of really interesting ideas and options, including the possibility of testing a deceased dog. The company definitely has some advantages, but they are currently overshadowed by the red flags we mentioned in the previous sections of our DNA My Dog review. All in all, if you want to learn all there is about your dog or you are a professional breeder or veterinarian, DNA My Dog is probably not the best choice for you. 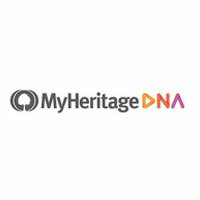 On the other hand, if you are a private owner and just want to get a better understanding of your dog’s heritage and health, DNA My Dog might just be what you are looking for. You will get all the essentials, learn how to care for your dog properly, and even save some money along the way. Our ratings are the result of an objective and independent evaluation of DNA My Dog , generating the final rating that reflects the overall quality of the company. Ratings may change as the service changes. DNA My Dog user rating based on 3 user reviews. Good value for the price but the user support is almost nonexistent. Neat little test but not as good as embark. Especially for breeders like me. Had to wait for my testing kit for 5 weeks! We found 0 verified DNA My Dog discounts for April, 2019. There are no DNA My Dog coupons or discounts right now.